HUNTINGTON, W.Va. – This is the perfect month for a fairytale on the basketball court. March is about Cinderellas, after all. Ring season came with a twist Saturday afternoon at the Henderson Center. Prior to Marshall's 76-61 win against Florida Atlantic in the regular season finale for both teams,Jon Elmore and three teammates – C.J. Burks,Christian Thieneman andRondale Watson – were honored in what could have been their final collegiate home game. After a group picture with the players and their families, Elmore created a storybook moment for him and his longtime significant other, Tori Dent. 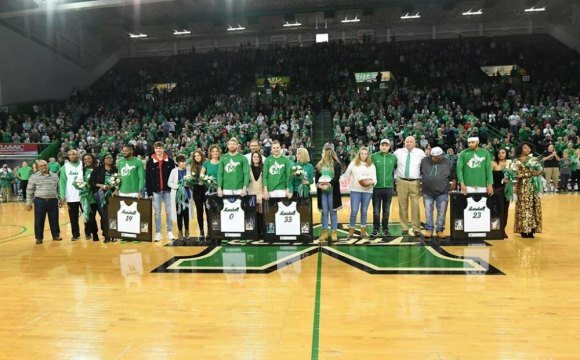 A short video starring Elmore played on the hanging scoreboard above the court, and then Elmore took a knee on the midcourt logo, opened a box with an engagement ring inside and extended his arms toward Dent, a former Thundering Herd student-athlete. "By the way, will you marry me?" he asked. "Of course I will," Dent replied. "OK, babe. I've got a game to go play," Elmore said before hustling to his team's bench. Marshall then erased a 17-point deficit to FAU for its largest come-from-behind win of the season. The victory was the perfect ending on an afternoon in which some of the most decorated players in program history – all of whom were part of helping the team during last March's historical run – were honored for their contributions to the program. The stage was set for Elmore, a Charleston native who was the Conference USA tournament MVP last season. "It's so sweet that he did it this way," Dent said. "I've truly had dreams of him doing this on senior night. It's so cute. The fact that he did it like this with the video and the extra stuff, it literally made my dreams come true. I couldn't ask for a better way for it to happen, and I couldn't ask for a better man." Elmore recorded his 19th career double-double, scoring 16 points and grabbing 10 rebounds. He reached yet another milestone, becoming the 69th player in college basketball history to score 2,500 career points. He is two assists away from becoming the first player in men's college hoops history with 2,500 points and 750 assists. "Jon took the great leap of faith and still played afterward," Marshall coach Dan D'Antoni said. "That shows you he's a stronger man than me." The emotions from the pregame festivities and Elmore's proposal might have lingered into the opening minutes of the game. FAU built a 19-2 lead, and the Herd missed 11 of its first 12 shots and its first six from 3-point range. "Marshall basketball is all about the flair," Elmore said. "We make it exciting. We had an emotional pregame sending the seniors out … we started out slow." After trailing by 17 points with 12:54 left of the first half, Marshall outscored FAU 74-42 the rest of the way. Sophomore guard Jarrod West led the team in scoring for the first time this season, finishing with 17 points on only seven attempts from the floor. He also had three assists and three steals with no turnovers in 29 minutes. Burks scored 11 points, passing Ryan Taylor for eighth place on the program's all-time scoring list. Freshman Taevion Kinsey also finished with 11. "Obviously a little emotional," D'Antoni said. "We started out a little slow … Defense was excellent. We took them out of everything they wanted to do." The Herd outrebounded an opponent for only the third time in 31 games this season, holding a 40-30 edge on the boards. The plus-10 rebounding margin is a season-best for Marshall. The win is the fifth in a row for the Herd, which opened Conference USA play with a 5-0 record, lost seven of eight games, and then closed with another five-game winning streak. Marshall is 18-13 overall entering Wednesday's C-USA tournament in Frisco, Texas. The Herd is the No. 6 seed and will meet No. 11 Rice on Wednesday at 10 p.m.
Marshall needs to win games on four straight days to defend its conference championship and earn the accompanying NCAA tournament berth. Last year, Elmore secured a championship ring. Saturday, he slipped a ring on a girl's finger. He has eyes on one more next week. "We're not finished yet," Elmore said. "Our goal is to go down there to Frisco and win four games in four days and go back to the Big Dance." Elmore has 2,505 points, which ranks No. 64 in NCAA history. On Saturday, Elmore passed Terry Dehere, Elgin Baylor, Jeff Grayer, Caleb Green and Bill Bradley on college basketball's all-time list. Burks has 1,787 points, which passed former teammate Ryan Taylor (1,778, 2013-17). Burks is 5 points shy from tying Tamar Slay (1,792, 1998-02) for No. 7 on the program's all-time scoring list. Burks played in his 124th game Saturday, which is tied with Tirrell Baines (2007-11) for the sixth most in program history. West passed Tyrone Phillips on the single-season steals list, and now has the fourth-most by any player in one season in program history. West has 67 steals this year. Phillips had 65 during the 1992-93 season. West made both of his 3-point tries Saturday, giving him 107 made 3s in his career. That ties Marshall great Cornelius Jackson, now a Herd assistant, for No. 22 all-time. In Marshall's last three wins – at North Texas and home against FIU and FAU – the team faced double-digit deficits but came back to win. Chuck McGill is the Assistant Athletic Director for Fan/Donor Engagement and Communications at Marshall University and a seven-time winner of the National Sports Media Association West Virginia Sportswriter of the Year award. In addition to HerdZone.com's Word on the Herd, McGill is the editor of Thundering Herd Illustrated, Marshall's official athletics publication. Follow him on Twitter (@chuckmcgill) and Instagram (wordontheherd).